One of the issues, Thomas L. Bradbury, MD, believes, is that surgeons template in the coronal plane, which gives a good frontal representation of the body, but may not be adequate. Templating in the axial plane, he said, would give surgeons a better understanding of the version of the components. During his presentation, Dr. Bradbury reviewed the steps for measuring combined version and used examples from his patient population to demonstrate how it is applied. 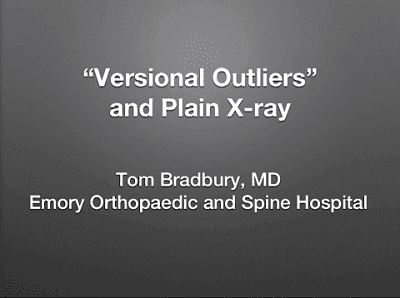 Click the image above to watch Dr. Bradbury’s presentation and learn more about this technique. Dr. Bradbury has no disclosures relevant to this presentation. Abdel MP, von Roth P, Jennings MT, Hanssen AD, Pagnano MW. What safe zone? The vast majority of dislocated THAs are within the Lewinnek safe zone for acetabular component position. Clin Orthop Relat Res. 2016 Feb;474(2):386-91. doi: 10.1007/s11999-015-4432-5. Widmer KH. Zurfluh B. Compliant positioning of total hip components for optimal range of motion. J Orthop Res. 2004 Jul;22(4):815-21. Decker S. Suero EM, Hawi N, Müller CW, Kretteck C, Citak M. The physiological range of femoral antetorsion. Skeletal Radiol. 2013 Nov;42(11):1501-5. doi: 10.1007/s00256-013-1687-3. Epub 2013 Jul 16. Tiberi JV, Pulos N Kertzner M, Schmalzried TP. A more reliable method to assess acetabular component position. Clin Orthop Relat Res. 2012 Feb;470(2):471-6. doi: 10.1007/s11999-011-2006-8. Budin E. Chandler E. Measurement of femoral neck anteversion by a direct method. Radiology. 1957 Aug;69(2):209-13. Lee YK, Kim TY, Ha YC, Kang BJ, Koo KH. Radiological measurement of femoral stem version using a modified Budin method. Bone Joint J. 2013 Jul;95-B(7):877-80. doi: 10.1302/0301-620X.95B7.31195. Boissonneult AR, Hiranaka T, Robertson JR, Bradbury TL. A validated single-view radiographic alternative to computed tomography for the measurement of femoral anteversion: a method-comparison study. J. Arthroplasty. 2017 Mar;32(3):1018-1023. doi: 10.1016/j.arth.2016.09.016. Epub 2016 Sep 28.